There's a range of places to eat and drink at Handa Opera on Sydney Harbour, with options to suit every appetite and budget. The site opens at 5pm. 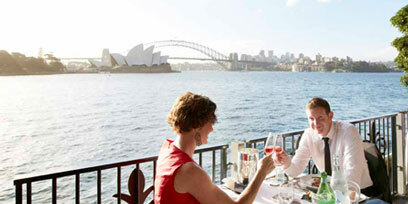 Plan to arrive early and savour a drink and something delicious while you watch the sun set over the harbour. Five different restaurant and bar areas on site serve a range of foods to suit every appetite and budget, featuring the flavours and finesse of French cuisine. A selection of these beverages is available at every bar. Fresh Catering use practices to minimise contamination of allergy-friendly menu items. However, Fresh kitchens are not entirely gluten or nut free. Traces of gluten or nuts may be present in food labelled gluten or nut free which could affect some people who have severe allergies. Published menu is subject to change without notice. The Travel Associates Platinum Club at Handa Opera on Sydney Harbour is an exclusive undercover restaurant and bar with spectacular views overlooking Sydney Harbour. Reservations are essential.